Care for Earth is universal, crossing boundaries of geography and faith. We have a unique opportunity to join in solidarity with a group of indigenous grandmothers from across the world in strengthening the human family “for the next seven generations” through prayer and community. The Grandmothers of the Sacred We are members of indigenous tribes from many parts of the world. They travel the globe offering their love, healing, and support to the inter-connectedness of all. From Standing Rock, to the People’s Climate March, to the UN Conference on Indigenous Peoples and beyond, these women are committed to offering prayer and education as a means to strengthen humanity. They are coming to Kalamazoo to offer prayers for a very precious resource – the waters of the Great Lakes, which together comprise 20% of the Earth’s fresh water. 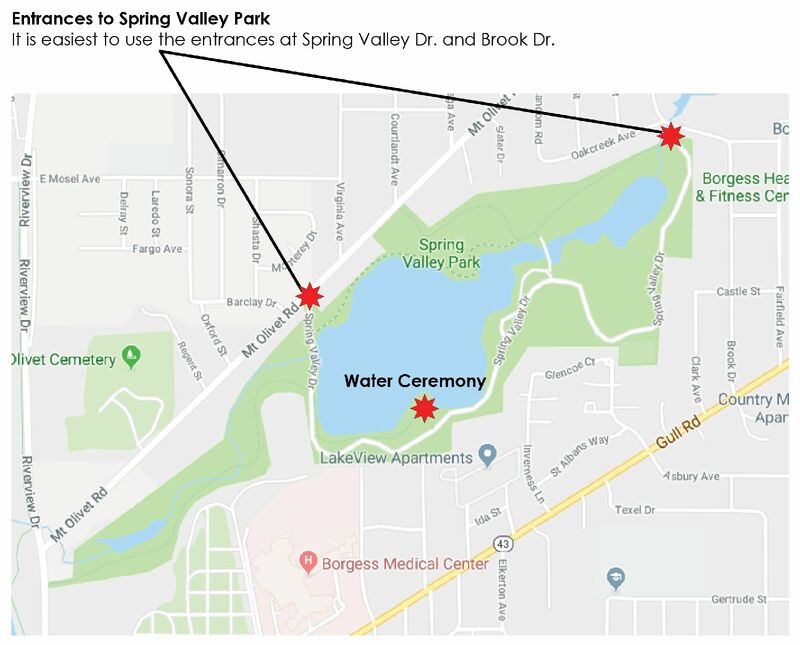 We will begin at Spring Valley Park, part of the Davis Creek Watershed – a tributary that feeds into Lake Michigan. There the Grandmothers will share a water ceremony that honors the world’s waters and prays for the healing of and connection with life sustaining waters. Immediately following this ceremony, we will gather for a meal inspired by Native American cuisine, and for drumming and circle dancing led by Great Lakes region indigenous people. This is a ticketed event. Tickets are $25 per person for the dinner/dancing/drumming event. Due to the high volume of interest expected, online pre-registration with payment is required by August 30. We will not be taking mail-in payments or walk-in registrations. The water ceremony is free, but registration is required. Bring your own chair or blanket with you to Spring Valley Park. Rain location for the water ceremony will be at the Parchment United Methodist Church, 225 Glendale Blvd, Parchment, MI 49004. Space is limited–so don’t delay! This program is offered through a partnership between Transformations and the John E. Fetzer Institute whose mission is helping build the spiritual foundation of a loving world. *** This is a drug and alcohol free event. Please leave your pets at home. Dinner, Dancing and Drumming is Full! Thank you Four Elements Energy! Thank you for responsibly powering sound at the Water Ceremony!